Want a way to make your high-end merchandise shine? 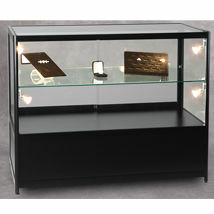 Then install one of our Lighted Display Cases with Storage. 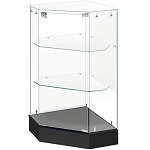 Our enclosed case is constructed of black aluminum trim with tempered glass panels, sliding glass doors for easy access and one adjustable glass shelf. 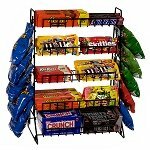 The shelf is 3/16 inches thick and measures approximately 19-inches deep. 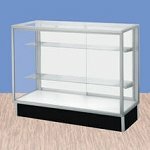 Adjust the shelf so you can use the bottom to exhibit materials as well. Have your jewelry and collectibles sparkle brightly and securely! There is security in knowing your materials are locked up. This Lighted Cabinet contains a handy storage compartment for storing extra merchandise in. Order yours today and illuminate your possibilities.